Let’s examine each of these design goals in more detail. First off AMD claims improve performance from the new Trinity APU as a goal and frankly we be quite surprised if the new Trinity did not outperform the older Llano APU. Given the new piledriver architecture, enhanced graphics, and greater energy efficiency the new Trinity should easily trounce the older model in all areas. 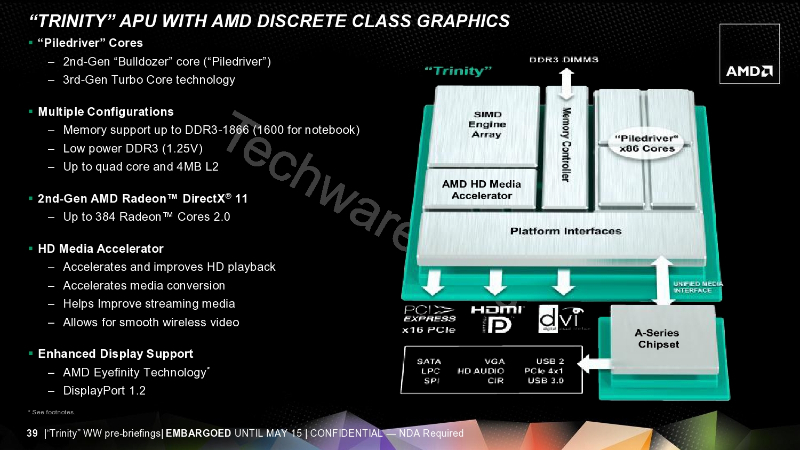 Secondly AMD claims enhanced media capabilities for the new Trinity. this also is pretty much a no-brainer as the new AMD Trinity would given its piledriver architecture as well as enhanced graphics outperform the older Llano processor. 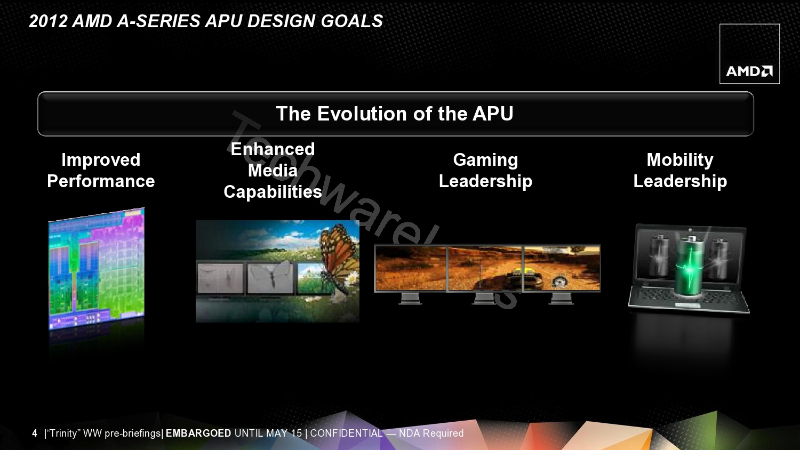 Third AMD claims gaming leadership for the Trinity APU as a design goal. to set gaming leadership as a goal for the new Trinity APU is admirable but may be setting the new Trinity APU up for failure. To claim gaming leadership in the mobile segment is a hard enough accomplishment for a discrete graphics card or provider. For the Trinity APU to claim gaming leadership it would have to overcome a lot of negative AMD history in the mobile market as well as consumer lack of familiarity with AMD’s product offering. As we don’t yet have an AMD Trinity APU in hand to test in a mobile platform we can’t say how close it comes to achieving its goal of gaining leadership. We hope the best for this new product offering from AMD but like many consumers we’re a bit hesitant to believe the Trinity APU will live up to AMD’s goals. Last of the AMD design goals for the Trinity is mobility leadership. With the launch of the AMD Trinity they may indeed realize this goal. The Trinity offers key enhancements which consumers will flock to such as increased battery life, a lower price tag, and higher end graphics for the associated price tag. We will go into more detail on each of the enhancements that Trinity brings to the market later in this article, for now it is our opinion that the Trinity is uniquely positioned in the mobile marketplace out of all of AMD’s offerings in the last decade to accomplish this goal. If we examine the graphic above a few things become immediately apparent; first the new Trinity uses the northern islands AMD Radeon GPU. Second the new Trinity supports up to four piledriver cores each with 2 MB of L2 cache. Furthermore the new Trinity supports HDMI, DisplayPort 1.2, and standard DVI as well as having 24 lanes of PCI express I/O. as you can see almost half of the new Trinity APU is dedicated to the GPU. Clearly graphics plays a major role for the new Trinity and AMD is seeking to leverage the success of its Radeon architecture greatly in this new product. Overall the Trinity is targeted towards inclusion in three main product types of system offerings. While this does not mean we will not see the Trinity included in standard desktop systems I think it’s more likely that AMD and OEMs are likely to opt for higher-end CPUs for desktop systems. How can you say you don’t know if Trinity is a winner when it brings significantly better CPU/GPU performance over Llano which was very adequate for most mainstream consumers? SB is just barely faster in CPU performance and isn’t in the same iniverse as Trinity. Pretty much every reviewer has confirmed that Trinity is a winner on all fronts including battery life and price in addition to CPU/GPU performance. BTW consumers do not want Ultrabooks and that is why even with lots of Intel bribe money sales are very poor. Ultrathins are a sure success for AMD especially when priced hundreds less that a shiny under-powered Ultrabook. Trinity is still not proven a success for AMD. 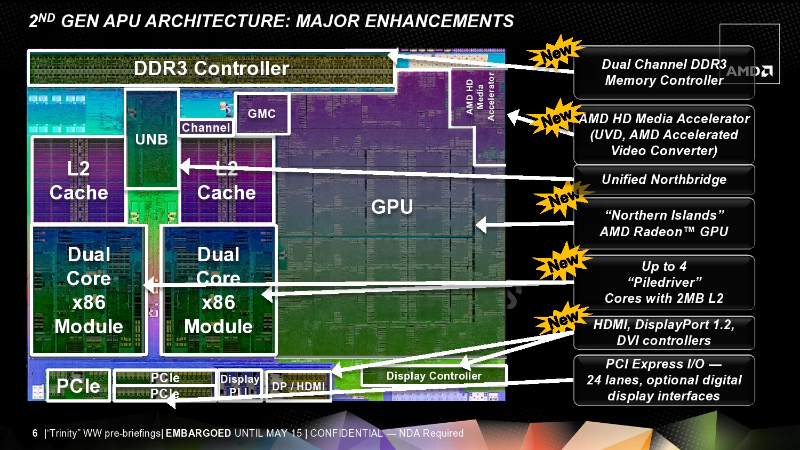 As a Processor it is certainly a step forward in the right direction, and it will be a great consumer option. The problem lies in AMD overcoming years of shortcomings int he mobile market. Consumers by and far prefer Intel in their laptops. In that regard Trinity has a lot of hard work ahead. No product just steps out of the shadow of years of history to become an overnight success. So is Trinity a winner for AMD. . . not yet. I cannot declare a product a winner for which I have not even tested. And even had I the product in hand, consumers have the overall sway of the market. If they adopt then it is so. I still hold firm to my statement, Trinity holds great potential for AMD. Now all they have to do is get the word out there and convince consumers. The first step in doing so would be to get us a system.